Kess is a spunky gal who doesn’t let much of anything slow her down. She was adopted at 6 months old from Whatcom County Animal Control. She is the second dog I have owned and it soon became clear that she was destined to be an amazing athlete. I had never done any sort of serious dog training and had certainly never participated in dog sports before Kess came in to my life. Soon we were out at sheep herding lessons on Tuesdays, flyball lessons on Sundays and frisbee practice whenever we could find the time. Kess was extremely talented at everything she tried and I couldn’t have hoped for a more wonderful companion. Starting a little after age 2 Kess had intermittent lameness. It always seemed to clear up after a couple of weeks of crate rest, but by the time she was 4 it had become a chronic condition and there was a visible protrusion from her rear leg ankle joint. We got her in to the vet who tested the mass through a needle biopsy and determined the cells to be non-cancerous. They recommended surgery to remove the mass and fix up the joint. We followed through with the surgery and 6 weeks of crate rest. The mass removed from her leg was sent off for tissue testing and again came back negative for cancer. Sadly the leg never healed properly and we spent the next two years going to several different veterinarians and trying various antibiotics, compressions wraps, and steroids all to no avail. The mass returned and grew much larger. We again tested for cancer and were told for the third time that our dog did not have cancer. With no clear solution in sight and a useless painful leg we decided to go forward with an amputation. Kess’s leg was removed on Oct 19, 2010. After the amputation the surgeon called and requested I have the tumor tested yet again. I thought it was a waste of money, but she was adamant so we went ahead with the test. 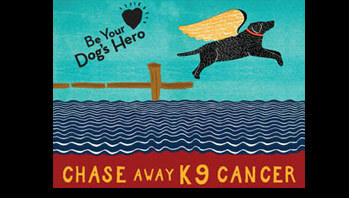 I can tell you that it absolutely knocked the wind out of me when I got the call that Kess’s tumor was in fact a Synovial Cell Sarcoma. Of course the first thing I did was head for Google only to met with websites proclaiming that I had less than 6 months left with Kess. 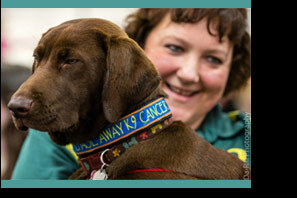 We found great comfort in the site Tripawds.com and it was wonderful to see all the happy healthy tripawds on the site to give us hope while we worked through the first few weeks after the amputation. I’m so happy to say that at this time Kess is a happy cancer-free tripawd. Things are a little different around the house now, but Kess just takes it all in stride. 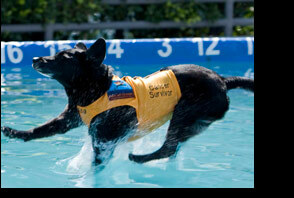 She continues to play frisbee and perform with the Full Tilt canine disc demonstration team. 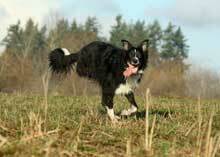 She also enjoys romps at Marymoor park, and has started agility lessons. If you were to describe Kess in a word it would be exuberance. She takes on life at full speed and looks for the fun in everything.